As promised, here are more animated display pictures of Euro 2008 goals. All of them by the Dutch team (again) but you have to admit, they're playing some devastating football and some of these goals are simply world class. Besides, their goals posted yesterday have proven very popular with thousands of hits already. Click on your favorite goal in the list below, then drag 'n drop it onto your current display picture in Windows Live Messenger 9.0 Beta. >> Browse all Animated Display Pictures of Euro 2008 Goals. >> Grab 10 free animated Cristiano Ronaldo Emoticons. >> Overview of all Euro 2008 Windows Live Messenger Goodies. - It's not present in all conversation windows, just with certain contacts. - It doesn't replace the webcam icon that's normally positioned there, but appears to the left of it. - It appears in Windows Live Messenger 8.5 and (as reported by chickenroyal) 8.1. - UPDATE (reported by Scizz and senayel): In Windows Live Messenger 9.0 Beta, it's not a box but the Office icon (screenshot). Is it a new advertising space? A webcam preview? A status icon or display picture? Is it just a bug? >> What's the "white square of mystery" according to you? Speculate on our forum. UPDATE: The Messenger team speaks: "it was only a bug." Here are just the thumbnails, but click the links below for the real (animated) thing and then just drag 'n drop them onto your current display picture in Windows Live Messenger 9.0 to activate them immediately. >> Any other goals, saves, penalties or actions you'd like to see as animated display pic? Let us know. NOTE: The unreleased and private Windows Live Messenger 9.0 Beta is required for displaying animated avatars. Free animated Cristiano Ronaldo emoticons for Portugal fans! Paying homage to the first team into the Euro 2008 quarter-finals, we have made animated emoticons featuring Portugal's Ron, Cris, Ronnie, The Sultan Of The Stepover, or arguably the Best Player of Euro 2008: Cristiano Ronaldo. Our pack includes 10 animated Cristiano Ronaldo emoticons and one bonus animated display picture. The whole lot can be downloaded for free and in one click with CustoMess (about time we dusted that little gem off!). For the uninformed, CustoMess is Mess.be's small and free application for easily adding custom content to MSN/Windows Live Messenger. You can find Ron under Latest Packs or Emoticons. The keyboard shortcuts are simple, just your standard emoticons preceded with ron, so we have ron:) ron:D ron;) ron:( ron:'( ron(h) ron:o ron8) ron:@ and ron:$). That's all you need to know to go Cris-crazy! 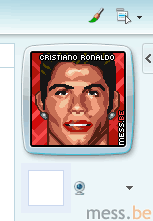 Oh, and point your buddies to CustoMess if they want to add Ronaldo to their custom emoticon collections as well! >> Like these emoticons? Who would you like to see as an emoticon? Your feedback is welcome on our forum! Messer KRB noticed that links to googlepages.com aren't blocked by the Messenger server anymore and that the domain has been removed from the SPIM filter by Microsoft's mysterious 3rd party partner. Although the domain had been blocked for a few months, they really do seem to act quicker on Google-owned domains (as with YouTube.com a few weeks back) than on other undeserved and still active blocks like eBuddy.com. According to Nielsen Online, the time British web users spent using MSN/Windows Live Messenger in April 2008 matched the number of minutes spent on Facebook: 2.4 billion. While that's a whopping increase for Facebook (coming from 500 million in April 2007), it's a considerable loss for Messenger that still accounted for 3.2 billion minutes in the same month last year. Alex Burmaster, internet analyst at Nielsen Online, defines it as a relatively rapid "seismic shift" from Instant Messaging to communication through social networks. IM in general appears to be over the hill (total minutes were down from 3.9 billion to 2.9 billion) and clearly losing ground to social networking (minutes up from 2.4 billion to 3.7 billion). The speed of the takeover is astonishing. Only last February the same analysts declared Windows Live Messenger as the most engaging application in the UK.